Good news for all cellphone repair shop owners! RepairDesk has just launched its integration with MailChimp. Now you can boost your e-marketing campaigns with the help of RepairDesk's MailChimp Integration. MailChimp is used by more than 15 million people around the globe who utilize its tools for advertising and marketing purposes. You can automate your marketing, send beautiful newsletters, send personalized campaigns and measure the success of your campaigns in terms of concrete facts. - Un-sync specific customers in RepairDesk from your mailing list. - Save your time and energy by automatically syncing your customer data with MailChimp instead of adding them manually. Excited? Cool! Let's get you started. 1. Login to your MailChimp account and head to Account Settings. 2. Under Extras, select API Keys to view API Keys Settings. 3. Click on Create a Key to generate an API key for MailChimp. Your API Key will appear under the heading Your API Keys. Make sure that its status is marked as Enabled. 4. Now login to RepairDesk and go to Settings. Click on Integrations. 5. 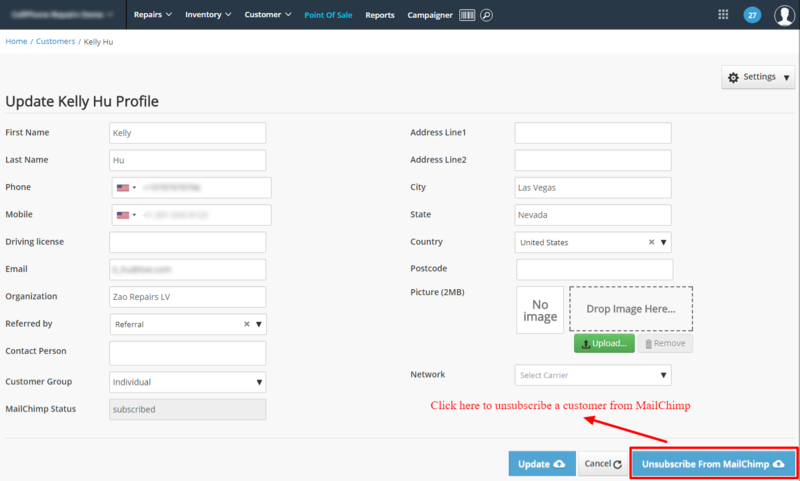 Under Marketing tab, select MailChimp Integration. 6. Enable the trigger: "Enable API". Enter your Username and API Key generated from your MailChimp account. Click on Select a List option and select the mailing list in MailChimp which you want to sync with RepairDesk. Click on Save Changes to complete integration. Note: Customer records will be added to the selected mailing list in MailChimp within 10 to 15 minutes. 7. Now if you go to Manage Customers you will be able to see a column titled "MailChimp Status". Those customers which have been synced with MailChimp will have the status "Subscribed" against them. Note: When a new customer is added to RepairDesk while integration with MailChimp is active, it is automatically synced in the selected mailing list. 8. If you want to remove a customer from your mailing list in RepairDesk, simply open that customer's record in RepairDesk, select the Edit option and click on "Unsubscribe From MailChimp". Once the record is Updated, this customer will be removed from your mailing list in MailChimp. Q. Can I change the mailing list from the settings? A. Sure! You can create another list on MailChimp and sync it with RepairDesk or sync an existing one. 1. Go to MailChimp Integration Settings. 2. Under the option "Select a List", choose any mailing list on your MailChimp account from the drop-down menu. 3. Finally, click on Save Changes. 4. Now the selected mailing list in MailChimp will be synced with RepairDesk and customers will be added to this list. Q. Are customers unsubscribed automatically from repairdesk if they unsubscribe themselves from emails? A. Yes. Once a customer opts-out or unsubscribes from your email, the status for that specific customer also automatically changes to "Unsubscribed" in RepairDesk.